The NBA salary cap doesn’t benefit players or the fans — it lines the pockets of billionaire team owners. Even before the NBA season started earlier this month, the drama was already in mid-season form. 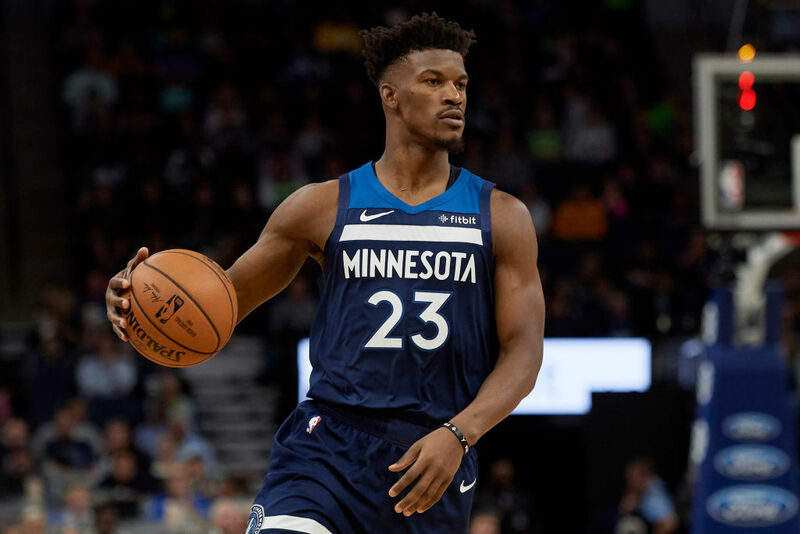 Minnesota Timberwolves star Jimmy Butler met with coach and team president Tom Thibodeau and reiterated a desire he’d expressed this summer to be dealt. The news leaked, hot takes were so gallantly streaming, and sports media’s bottomless maw had a new chew toy. Every party in the story was ripped as culpable for the Butler/Minnesota divorce: Butler; his teammates; the front office; the owner; the media. But the true villain in this story gets off scot-free, as always. What’s wrong with the Butler situation is what’s wrong with the NBA: the salary cap. The salary cap is a somewhat-flexible limit the league imposes on team payrolls. The figure changes every year and is calculated according to changes in the NBA’s basketball-related income (BRI). This year the cap is just under $102 million per team. Usually cap changes are modest, but two years ago new media rights values saw it jump from $69 million to $91 million; with the NBA’s embrace of legalized sports betting, the cap is likely to rise again. Through certain exceptions teams can go over the cap, though there are penalties to dissuade them from exceeding it too much or too often — for years owners have sought to iron out these wrinkles and institute a hard cap. While rookies and minimum contracts are fixed figures, the cap determines the largest player salaries. Players employed at least ten years can earn up to 35 percent of the salary cap. Fans are told the cap promotes competitive balance. Fans are told fans want this. History shows NBA fans have never cared about parity. The cap deprives players of earning their true market value, it allows teams to look like they care about winning when there’s no evidence the cap does anything beyond let teams spin their wheels while they rake in and hoard profits. It is quintessentially American to have a multibillion-dollar business in 2018, comprised mostly of wealthy white owners, entitled to the idea that their mostly black workforce should be underpaid and grateful for it. Michael Jordan earned $93 million over a fifteen-year career. Over his first fifteen years, LeBron James earned $237 million. Couple that with the four-year, $154 million deal James signed last summer with the Los Angeles Lakers and it may seem today’s stars are fairly compensated, if not excessively so. But the gap between working-class fans and millionaire players is no less a chasm than that between millionaire players and billionaire owners. Fans argue whether Jordan or James is the greatest player in NBA history; undoubtedly, they are its two most underpaid. Jordan made more in royalties alone in 2014, more than a decade after retiring, than he did over his entire playing career. In thirteen of his fifteen seasons, he earned $4 million or less. When he retired from the Bulls in 1998, Forbes calculated Jordan’s impact on Chicago’s home and gate receipts alone at $166 million. Bulls’ owner Jerry Reinsdorf bought 56 percent of the franchise for $9.2 million a year after the team drafted Jordan; by ‘98, the team was valued at over $200 million. When LeBron left Cleveland to sign with Miami, the Cavaliers’ franchise value fell by 25 percent. When he returned in 2014, ESPN estimated his impact on Cleveland’s local economy at half a billion dollars. Like Reinsdorf and Chicago, Cavs owner (and Quicken Loans robber baron) Dan Gilbert paid $375 million for the team a year after drafting James. Even if the franchise worth fell 25 percent again after James left for LA, that’s a value of $900 million. If Gilbert sold the team tomorrow, that’s a $525 million profit. Imagine cap logic applied elsewhere. Imagine Hollywood claiming a cap would improve competitiveness between studios, and therefore movies as a whole. It beggars belief. It wouldn’t help the consumer any. The Cheesecake Factory capping what workers there earn doesn’t make Waffle House’s food any better. The greatest lie the NBA ever told the world is that restricting player salaries leads to greater competitiveness, and that they’re doing it for the fans. The NBA, since its inception in 1947, is not and never has been competitive. Almost every decade has been dominated by a couple of teams; the only decade that wasn’t, the 1970s, saw eight different teams win titles during what was the league’s nadir as far as ratings and popularity. Jordan, Magic Johnson, and Larry Bird are canonically celebrated for “rescuing” the NBA from those dark days, even though only five teams in the 1980s even reached the finals. Today, Golden State rules the league with an iron fist, topping three titles in four years by adding yet another superstar in DeMarcus Cousins. Earlier this month they played LeBron’s Lakers in a meaningless preseason game. It was ESPN’s highest-rated preseason game ever. NBA athletes, of course, earn more in a year than most workers earn in a lifetime. And their incomes should be subjected to a progressive tax. But class is less about gradational questions of how you much you earn and more about relationship questions of power. There’s no doubt about who’s benefiting from the current NBA salary-cap regime — it’s not players or fans. Matthew Miranda writes about sports for SB Nation and FanSided , and teaches English and writing at Stony Brook University.